The Stop TTIP Manchester protestors dropped warning signs in the Arndale Centre following the zombie flashmob. Photo: Stop TTIP MCR @Facebook. Stop TTIP Manchester rallied over 80 zombie protestors to raise awareness of the trade deal over negotiations which were held in Washington DC last week. The action was one of more than 500 public demonstrations across the globe against the Trans-Atlantic Trade and Investment Partnership (TTIP). The zombies, complete with TTIP blindfolds, stumbled through the area of the Arndale Centre outside of the Next department store, attracting large crowds whilst being fed chlorinated chicken before playing dead. A stop TTIP chant followed, whilst a banner was dropped from the floor above reading ‘Time is ticking for TTIP’. TTIP is proving to be one of the most controversial pieces of legislation that the European Commission has yet attempted to pass, with critics denouncing the proposal as giving international corporations unprecedented power, placing the NHS and other public services at risk of privatisation. 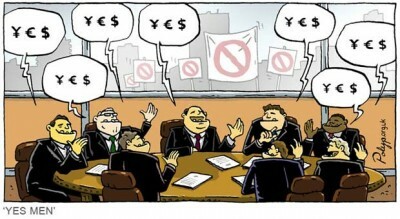 The treaty would allow governments to be sued by corporations if their laws or policies damaged the company’s profits. Yet the European Commission’s public consultations in regards to TTIP, published this January, have shown that 97 per cent of those consulted opposed the proposal. 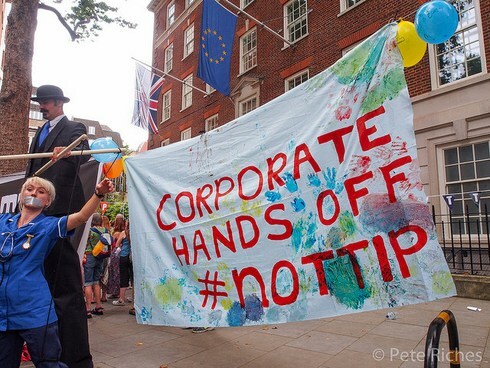 Guy Taylor, Trade Campaigner at Global Justice Now, said: “Election time is a reminder for what a huge threat TTIP would be for our parliamentary democracy. Politicians promise so much to ordinary people in the UK, but what they would be able to do would be dramatically limited if TTIP was implemented and corporate interests brought to bear on so many decisions of government. “We need to ensure that our democratically elected officials are free to act in the interests of the people they serve, rather than in the interests of corporate profits. Today’s action in Manchester is one of many happening around the UK, the EU and globally. We’ve signed petitions, lobbied and briefed MPs and MEPs, we’ve tried everything we can to stop TTIP, and they ignore us. At present over 1.6 million Europeans have signed a self-organised European Citizen’s Initiative (ECI) saying ‘no’ to TTIP. Manchester has been a focal point for the national campaign after hosting the ‘TTIP: Building the Fightback’ conference as part of the War on Want Annual General Meeting on the 21st of March. Here, Jeronim Capaldo from Tutts University outlined his research predicting a loss of at least one million jobs across the region and minimal gains in real terms. John Hilary, the Executive Director of War on Want, who has been dubbed the TTIP Terminator, said: “Politicians are fully aware of people’s outrage over TTIP and the other free trade deals being foisted by the EU. 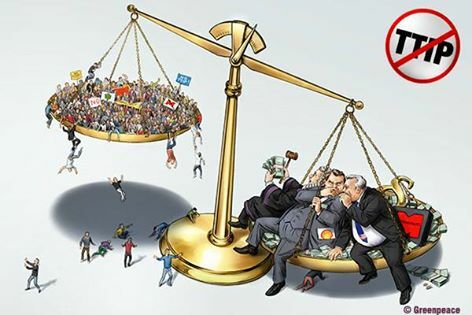 The European Citizen’s Initiative against TTIP can be found here.